What if writer's block became your most precious teacher? An empowering new process for writers who struggle with the seemingly insurmountable middle of a project, from the author of Writing Begins with the Breath. Writer’s block. If you are a writer, you know it can be a haunting, terrifying force—a wolf at the door, a vast conspiracy, something that keeps you up at night, spinning your wheels, going nowhere. But what if we’ve been thinking about writer’s block all wrong? What if, by paying attention to its qualities and inquiring into its hidden gifts, we can release that power? On Being Stuck is an empowering guide to working with your blocks and finding the friend within the beast. 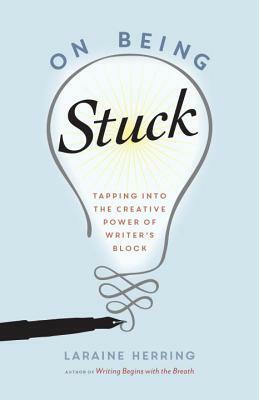 Using deep inquiry, writing prompts, body and breath exercises, and a range of interdisciplinary approaches,On Being Stuck will help you uncover the gifts hidden within your creative blocks, while also deepening your relationship to your work and reawakening your creative process. Laraine Herring holds an MFA in creative writing and an MA in counseling psychology. Her short stories, poems, and essays have appeared in national and local publications. Her fiction has won the Barbara Deming Award for Women and her nonfiction work has been nominated for a Pushcart Prize. She currently directs the creative writing program at Yavapai College in Prescott, Arizona and teaches at the Kripalu Center for Yoga and Health. She's the author of 7 books, including Writing Begins with the Breath and The Writing Warrior. She is a member of the Author's Guild and the American Association of University Professors, as well as the founder and Head Monkey of Fierce Monkey Tribe. She lives in northern AZ.